Int. J. Morphol., 27(4):1111-1119, 2009. * Department of Anatomy and Cell Biology, Faculty of Basic Medical Sciences, Obafemi Awolowo University, Ile-Ife, Osun State, Nigeria. ** Department of Physiological Sciences, Faculty of Basic Medical Sciences, Obafemi Awolowo University, Ile-Ife, Osun State, Nigeria. *** Department of Anatomy, Faculty of Basic Medical Sciences, Bowen University, Iwo, Osun State, Nigeria. **** Department of Anatomy, Faculty of Basic Medical Sciences, Ladoke Akintola University of Technology, Ogbomoso, Oyo State, Nigeria. *****Department of Chemical Pathology, School of Medical Laboratory Science, Igbinedion University, Okada, Edo State, Nigeria. SUMMARY: This study assessed the micro anatomical differences in the tongue of rat, bat and pangolin with a view to establishing the functional anatomical differences of these mammalian tongues on their dietary pattern. Ten rats, ten bats and ten pangolins were used for this study. The animals were sacrificed and the tongue excised and processed for light microscopical study adopting the following stains: Haematoxylin Eosin, Verhoeff Gieson and Masson trichrome. The results showed non papillation of the keratinized stratified epithelium of pangolin tongue unlike the papillation seen in the tongue of the rat and bat. While the filiform papillation seen in the rat was bristle like, the filiform papillae in the bat were crown-like. There was also an unusual dense collagenous ring in the proximal portion of the pangolin tongue which was absent in other mammals. There were taste buds along the lateral walls of the vallate papillae in the distal portion of the tongue of rats and bats but none was found in the pangolins. In conclusion, the morphology of the tongues of these mammals showed a relationship between their feeding pattern and the adaptive changes in the microanatomy of their tongue. KEY WORDS: Rat; Bat; Pangolin; Tongue; Micro-anatomy. RESUMEN: Se evaluó los aspectos micro-anatómicos de la lengua de la rata, murciélago y pangolín, con miras a establecer las diferencias funcionales anatómicas de las lenguas de estos mamíferos en su patrón alimentario. Diez ejemplares de cada animal se utilizaron para este estudio. Los animales fueron sacrificados y las lenguas fueron extirpadas y procesadas para el estudio microscópico de luz, usándose las tinciones: Hematoxilina Eosina, Verhoeff Gieson y tricrómico de Masson. Los resultados mostraron la no papilación del epitelio estratificado queratinizado de la lengua de pangolines a diferencia de la papilación vista en la lengua de la rata y del murciélago. Por otro lado, las papilas filiformes vistas en la rata se presentaban como puntas, siendo como coronas en el murciélago. También hubo un inusual anillo de colágeno denso en la porción proximal de la lengua de pangolines, estando ausente en los otros mamíferos. Se observaron botones gustativos a lo largo de las paredes laterales de las papilas caliciformes en la porción distal de la lengua de las ratas y los murciélagos, pero ninguno fue encontrado en la de los pangolines. En conclusión, la morfología de las lenguas de estos mamíferos mostró una relación entre su patrón de alimentación y los cambios de adaptación en la anatomía microscópica de la lengua. PALABRAS CLAVE: Rata; Murciélago; Pangolín; Lengua; Microanatomía. The tongue consists largely of skeletal muscle, partly invested by mucosa. The lingual mucosa of the inferior surface is thin, smooth and like that in much of the rest of the oral cavity. The mucosa of the pharyngeal part of the dorsum contains many lymphoid follicles (Heath et al., 1993). In the oral part the dorsal mucosa is somewhat thicker ventrally and laterally, it is adherent to muscular tissue, and covered by numerous papillae. It consists of connective tissue (lamina propria) and stratified squamous epithelium, which also covers each papilla. 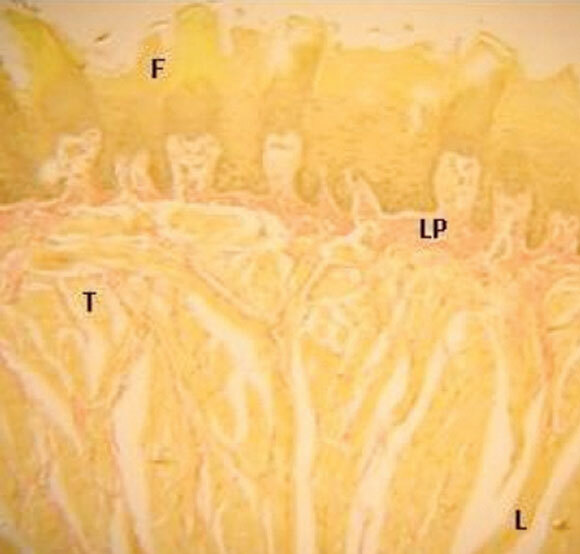 The lamina propria is a dense fibrous connective tissue; with numerous elastic fibres, united to similar tissue which spreads between the lingual muscle fasciculi (Heath et al.). It contains the ramifications of numerous vessels and nerves from which the papillae are supplied and also large lymph plexuses and lingual glands (Heath et al.). The epithelium varies from parakeratinized stratified squamous epithelium posteriorly, to fully keratinized epithelium overlying the filiform papillae more anteriorly, these features appears to be related to the fact that the apex of the tongue is subject to greater dehydration than the posterior and ventral parts and is more abraded during mastication (Heath et al.). In animals who chew their food in order for the teeth to function properly, food must be placed between them so that they can chop and grind it into small pieces suitable for swallowing. This placement is accomplished largely by the tongue, a sensitive, highly innervated, well-coordinated mass of muscle that sits on the floor of the mouth (Heath et al.). In addition to moving food about in the mouth, the tongue performs sensory and secretory functions: it is equipped with chemosensitive taste buds that test food quality, mechanoreceptors that monitor texture, and salivary glands that lubricate its epithelial surface. In humans, the tongue is capable of extremely fine movements that permit speech (Heath et al.). Studies of the comparative morphology of the tongue in living vertebrates have revealed how variations in the morphology and function of the organ might be related to evolution events. The tongue, which plays a very important role in food intake by vertebrates, exhibit significant morphological variations that appear to represent adaptation to the current environmental conditions of each respective habitat (Iwasaki, 2002). Bats, the second-largest order of mammals and characterized as the only mammals to have evolved true flight, are divided into two suborders, the Megachiroptera and the Microchiroptera. The megachiroptera feed primarily on plant materials while the majority of species that belong to the microchiroptera are insectivorous though some have become specialized for other kinds of diets. Some are carnivorous, many consume fruits, some are specialized for extracting nectar from flowers and one group of three species feeds on blood of other vertebrates (Savage & Long, 1986; Wilson & Reeder, 1993). The basic foraging behaviour pattern of frugivorous bats (Eidolon helvum) consist of two behaviors; search or orienting flight followed by approach behaviour including exploration flights, multiple approaches and final acquisition of a fruit (Okon, 1974; Kalko & Condon, 1998; Thies et al., 1998). Eidolon helvum feeds on fruits (Ofusori et al., 2008). With over 2000 living species in about 30 families, rodents are by far the largest order of mammals (Baratz & Farbman, 1975; Wilson & Reeder), with varying morphology. Ecologically, they are incredibly diverse; some species are highly aquatic, while others are specialized for life in the deserts. Many are to some extent omnivorous. Others are highly specialized eating, for example, only a few species of invertebrates or fungi (Feldhamer et al., 1999; Schwenk, 1989). Despite their morphological and ecological diversity, all rodents share one characteristic: their dentition is highly specialized for gnawing to an extreme, however seen in few or no other groups of vertebrates (Homberger & Bush, 1986; Savage & Long). The motivation to forage is very strong in rats (Rattus norvegicus), and they will readily work for the retrieval of food in the presence of freely accessible identical food. Their species-specific habit is to secure a piece of food in their teeth and carry it to a suitable spot where they adopt a squatting posture and transfer the food to the forepaws, and nibble gently at it; if they do not like the taste they drop it immediately. The opportunity to gnaw is an essential physiological and behavioral need for rats. Pangolins or scaly ant-eaters are a small group of nocturnal mammals in the order pholidota. The name "pangolin" is derived from the Malay word pengguling (curling). Pangolins range in size from about 1.6 kg to a maximum of about 33kg. Some species are arboreal while others are terrestrial. Their tongue is extraordinarily long and muscular, arising from the pelvis and the last pair of ribs deep in the animal's thoracic cage (Barlow, 1984; Doran & Allbrook, 1973). As a result, the tongue and associated muscles are longer than the animal's head and body, allowing the tongue to be extruded to an astonishing degree. Pangolins lack teeth; instead the pyloric part of their stomach is thickened and muscular, with odd keratinous spines projecting into its interior. It usually contains pebbles and seems to be used for "chewing" in much the same way as the bird's gizzard (Savage & Long). Tree pangolin (Manis tricuspis) eat insects such as ants and termite from their nets, or the armies of insects moving on the trees, though they may also gather surface ants which are located by smell. They rely on their thick skin for protection and dig into burrows with their long clawed forefeet. They eat between five to seven ounces (150 - 200g) of insects per day (Fahey, 1999). Termites and ants are lapped up with the tongue, which is covered in sticky Saliva manufactured by the huge salivary glands (Macrini, 2004). Pangolins have no teeth and require strong stomach muscles to grind the tough exoskeletons of their prey. Grit and stones are swallowed to assist in grinding in the stomach (Nowak, 1991; Scally et al., 2001; Ofusori et al.). Care of Animal. Ten rats, ten bats and ten pangolins of both sexes were used for this comparative study. The rats were obtained and maintained in the Animal Holdings of the Department of Anatomy and Cell Biology, Obafemi Awolowo University, Nigeria. They were fed with standard mouse chow obtained from Ladoke Feeds, Ibadan and given water liberally. The bats were harvested from their roosting colony on the Obafemi Awolowo University campus following ethical clearance and maintained in the animal holdings of the same Department. They were fed with ripe banana and water; the pangolins were procured 24hours prior to sacrifice. The animals were carefully assessed, screened and confirmed to be presumably healthy. Excision of the Tongue Tissue. Following the sacrifice of the animals by cervical dislocation (rat and bat) and anaesthestic administration of Ketamine to pangolin at a Dosage of 2 - 5mls/Kg, the mouth of the rats and bats were opened wide and the tongues excised using a sharp pair of scissors. Since the tongue of the pangolin extends from the mouth to the pelvic region, an abdominal incision was made, the abdomen opened and the tongue was excised. Histological Procedures. A portion of tissue were cut out from the tongue of the three mammals and fixed in 10% formol saline for a minimum period of 24 hours before further processing. The tissues were dehydrated through graded alcohol and cleared in 3 changes of xylene (1.5 hours each). Tissues were then infiltrated with molten paraffin wax at 56° C for 2 hours each in 2 changes of paraffin wax. Embedding was done in paraffin wax for a period of 24-48 hours. Sectioning was done at 5µm thickness on a Rotary microtome and then subjected to Haematoxylin and Eosin (H&E), Verhoeff-Van Giesson's and Masson Trichrome's staining procedures. 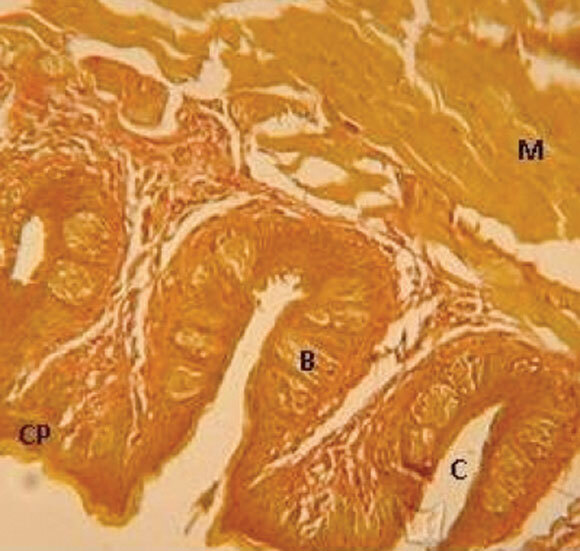 In rats, the mucosa consists of an outermost keratinized stratified squamous epithelium beneath which is a dense network of connective tissue called the lamina propria, in which are found numerous blood capillaries. The lamina propria is continuous with the epimysium of the muscular core and extends to the perimysium (Fig. 1). Fig. 1. A transverse section of the rat tongue showing the filiform papillae, F; lamina propria, LP; and transverse muscular fibress T (Verhoeff-Van Giesson x 50). The dorsal mucosa, unlike the ventral (Fig. 2) is thrown into papillae of different shapes and types - filiform fungiform papillae (mostly found in the anterior region of the tongue) (Fig. 1 and Fig. 3); and circumvallate papillae (only very few seen in the posterior region of the tongue) (Fig. 4). Within each papilla is a projection of tunica propria into the overlying epithelium forming secondary or corial papillae (Fig. 1). Fig. 2. 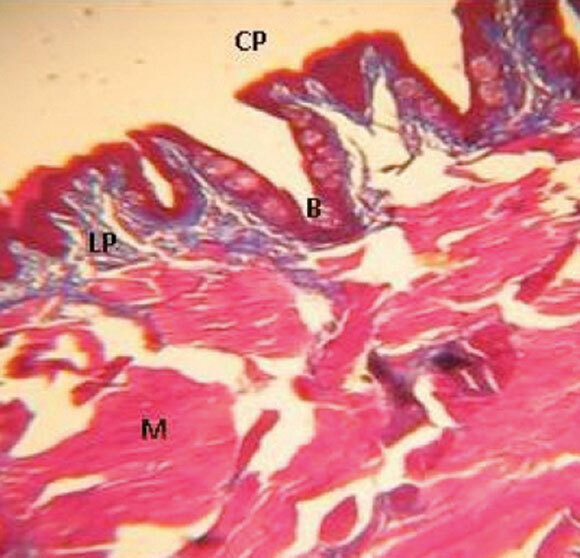 A transverse section of the ventral aspect of the rat tongue showing the epithelium, EP; lamina propria, LP; and muscular core, M (Verhoeff-Van Giesson x 100). Fig. 3. A transverse section of the rat tongue showing the fungiform papillae FU; lamina propria LP; muscle fibres (Haematoxylin and Eosin x 50). Fig. 4. A transverse section of the distal portion of rat tongue showing circumvallate papillae, CP; taste buds, B; lamina propria, LP; and muscular core M (Masson trichrome x 50). The muscular core consists of a mass of skeletal muscle of longitudinal transverse and oblique fibres (Fig. 3). 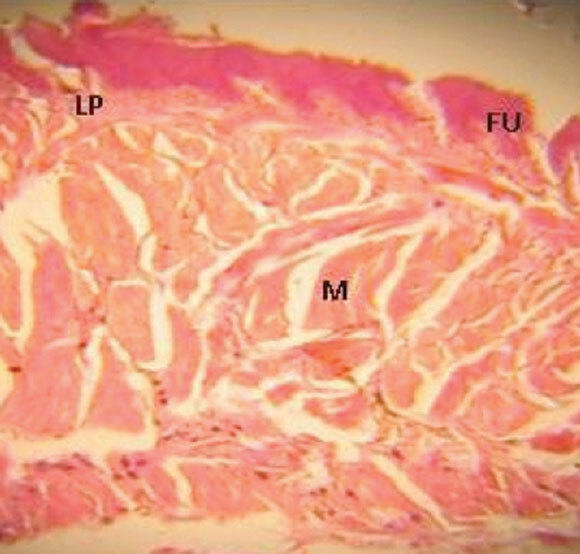 The muscle bundles are separated from each other by ramifying connective tissue which is continuous with the lamina propria of the mucosa (Fig. 2). Each taste bud is a small teardrop-shaped cluster of pale-staining cells which opens into the surface by means of a taste pore (Fig. 5). Fig. 5. Circumvallate papillae of rat tongue showing taste buds, B; taste pore, P; cleft, C (Masson trichrome x 200). The musculature of the tongue consists of distinct skeletal muscle bundles that run in transverse, longitudinal and possibly oblique directions. The anterior portion of the tongue consist of interlacing fibres (Fig. 6 and Fig. 7) with a transverse bundle seen at the central portion of the tongue (Fig. 9), however, the posterior portion consist of an outer transverse and inner double transverse bundles. In between the later is a longitudinal bundle that wraps around them separating them from each other and from the outer transverse bundle (Fig. 8). Fig. 6. A transverse section of the proximal portion of the pangolin tongue showing the smooth keratinized stratified epithelium, EP; lamina propria, LP; perimysium PY; muscular core (M) consisting of longitudinal and transverse muscle bundles (Haematoxylin and Eosin x 50). Fig. 7. A transverse section of the ventral aspect of the pangolin tongue showing the epithelium, EP; lamina propria, LP; muscular core, M; longitudinal muscle bundle, L; and transverse muscle bundle, T (Masson trichrome x 100). Fig. 8. 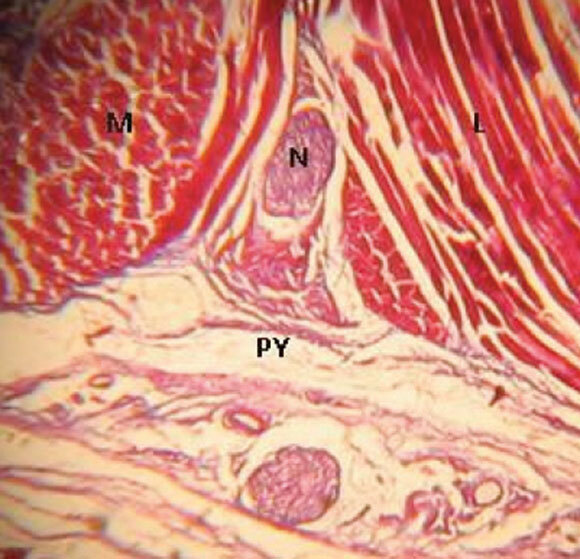 A transverse section of the distal portion of the pangolin tongue showing the transverse muscle bundle, M; longitudinal muscle bundle, L; nerve, N; and perimysium PY (Haematoxylin and Eosin x 100). 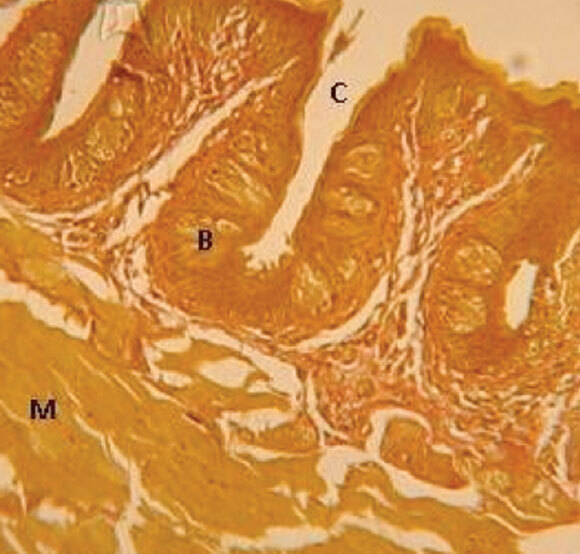 Figure 9: A transverse section of the pangolin tongue showing the ring of collagenous fibre, CF surrounding the muscle core M; and perimysium PY (Verhoeff-Van Giesson x 100). In bats, the mucosa consists of keratinised stratified squamous epithelium and a well pronounced collagenous lamina propria (Fig. 10 and Fig. 11) which is continuous with the epimysium of the muscles. The dorsal mucosa, unlike In pangolins, the mucous membrane is found on the proximal portion of the tongue and consist of a keratinized stratified squamous epithelium; that is devoid of papillae on both dorsal and ventral aspects (Fig. 6 and Fig. 7). Beneath the epithelium is a well-pronounced lamina propria, which is continuous with the epimysium of the muscular core (Fig. 6). The distal portion of the tongue does not show any epithelial lining (Fig. 8). Figure 10: A transverse section of the proximal one third on of the bat tongue showing the filiform papillae, F; secondary papillae, SP; and lamina propria, LP (Verhoeff-Van Giesson x 100). Fig. 11. A transverse section of the proximal third of the bat tongue showing the fungiform papillae, FU; secondary papillae, SP; and lamina propria, LP (Verhoeff-Van Giesson x 100). The body of the tongue tissue consists of a mass of skeletal muscles with numerous fasciculi of muscle fibres running transversely, longitudinally and obliquely (Fig. 12). The spaces within the fasciculi are filled with loose collagenous tissue, the perimysium, which is continuous with the delicate endomysium, separating individual muscle fibres in each fasciculus. Fig. 12. 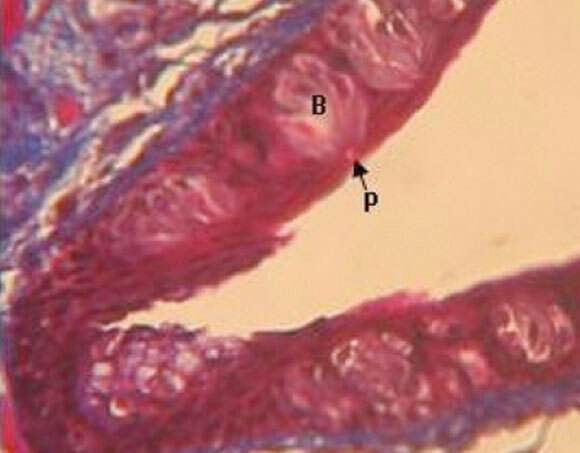 The ventral as pect of bat tongue showing the stratified squamous epithelium, EP; lamina propria, LP; and muscular core, M (Verhoeff-Van Giesson x 100). the ventral (Fig. 12) consist of crown-like filiform papilla (Fig. 10) amongst which are scattered few fungiform papilla (Fig. 11) in the anterior portion of the tongue while the posterior portion also have few circumvallate papilla bearing taste buds (Fig. 13). 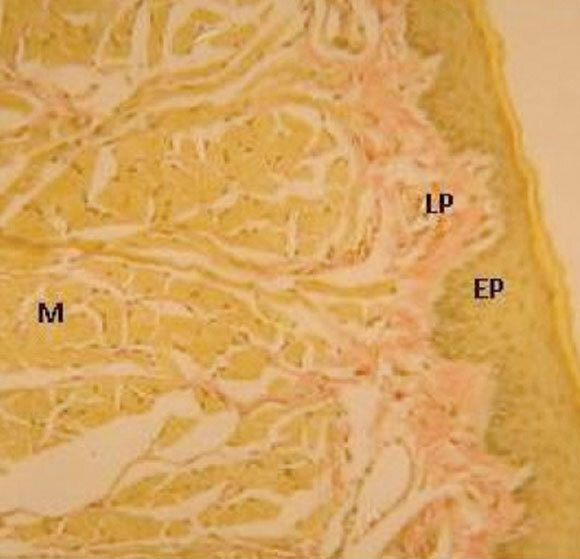 Within each papilla is a projection of lamina propria into the overlying epithelium forming secondary papillae. Fig. 13. A transverse section of the distal portion of the bat tongue showing the muscular core, M; taste buds, B; cleft, C; and circumvallate papillae, CP (Verhhoeff-Van Giesson x 100). These sensory cells are seen on the posterior part of the tongue. They are found on the lateral walls of the vallate papillae which surround the deep cleft; and each taste bud opens into the cleft by means of a taste pore (Fig. 14). Fig. 14. Circumvallate papillae of bat tongue showing taste buds, B; cleft, C; and muscular core, M (Verhoeff-Van Giesson x 100). Also, in all the three mammalian species, collagenous fibres were observed in the lamina propria beneath the epithelium in both dorsal and ventral aspects; in the rat, the collagenous fibres are more pronounced in the ventral aspect (Fig. 1 and Fig. 2). Furthermore the collagenous fibres extend from the lamina propria to continue into the muscular bundle as the perimysium and endomysium (Fig. 2, Fig. 7 and Fig. 12). 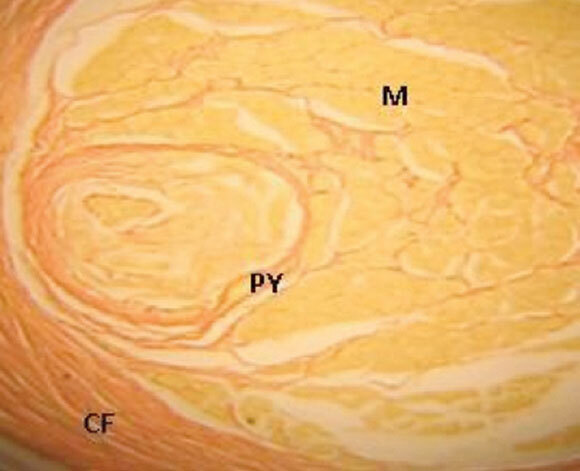 The central part of the anterior portion in the pangolin shows a distinct ring of collagenous bundle which surrounds the central transverse muscle fibres (Fig. 9). Significant differences were observed in the microscopic anatomy of the tongue of the rat, bat and pangolin as it relates to their varying feeding habits i.e omnivore, frugivore and insectivore respectively. Although stratification is a common feature of all parts of the oral epithelium of mammals, keratinization is normally associated with the masticatory oral mucosa that surrounds the dorsal part of tongue and seems to be related to the provision of protection against damage through wear, to tissue (Stern, 1980). The labial and buccal mucosa, which lie very close to the opening of the mouth, persist in being non-keratinized. However, keratinization varies in these three mammalian species. The hard keratinization, observed in the rat may suggest that the rat epithelium can withstand constant abrasion and desiccation that it is exposed to by reason of the food type of this animal, which includes hard pebbles. In the frugivorous bat, the level of keratinization is reduced compared to the rat since it feeds on succulent ripe fruits (Mikich et al., 2003) which is believed does not cause much abrasion and desiccation as the hard food substances fed upon by the rat. In the pangolin keratinization is very obvious in the anterior portions of the dorsal and ventral aspect of the tongue that lies within the mouth but gradually disappear along the distal part of the tongue that extends from the thoracic cage to the pelvic region of the animal. As the tongue of the pangolin is used primarily for prey capture and transport (Macrini) as in Iguania lizards, this keratinization prevents abrasion during the capture and transport of the ants/termites. In addition the sticky adhesive forces are surface dependant (Herrel et al., 2005) and they keep the prey attached to the tongue. Hence, the extensive variation in the keratinization of the tongue in these mammals not only suggests functional adaptation, but also phylogenetic adaptation as seen in the pangolin, as relates to their diets. The papillary morphology of the tongue in these three mammalian species is complex and shows clear structural difference as it relates to the dietary function of these tongues. Unlike Lacertid Lizzards, the entire epithelial surface of the pangolin is non-papillated, this may suggest that its tongue is not specialized for manipulation of food within the oral cavity and gustation, though the tongue primarily serves to trap insects with its sticky surface and transport it to the stomach which grinds the exoskeleton of its prey using its strong gastric muscles and grits and stones swallowed by the animal (Fahey). The differences in the shape of the papilla seen in the rat and bat are suggestive of the functional differences of these papillae. The bristle-like filiform papilla observed in the rat helps to increase the friction between the tongue and food substances, facilitating the movement of particles by the tongue within the oral cavity. Whereas the conical and crown-like filiform papilla in the bat functions primarily to retain food in the mouth during flight as confirmed by Okon (1974) and probably aid in oral absorption due to its increased surface area. In addition the gustatory papilla especially the circummvallate ones seen in the posterior portion of the rat and bat contains numerous taste buds which helps in taste reception. 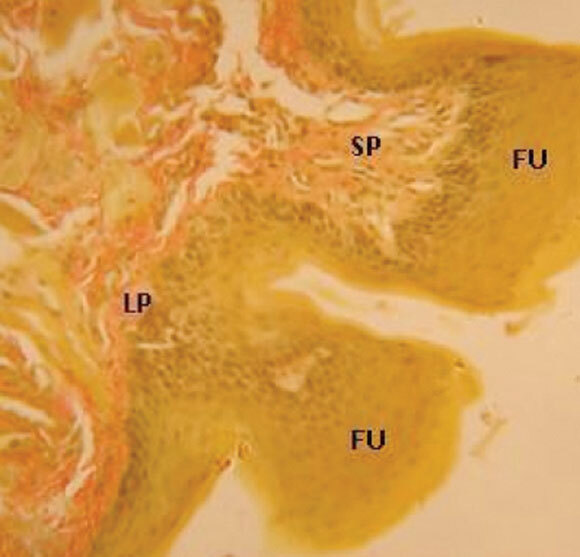 This structural difference in the papillary morphology relates to various functional differences seen in the tongue of these three mammalian species. 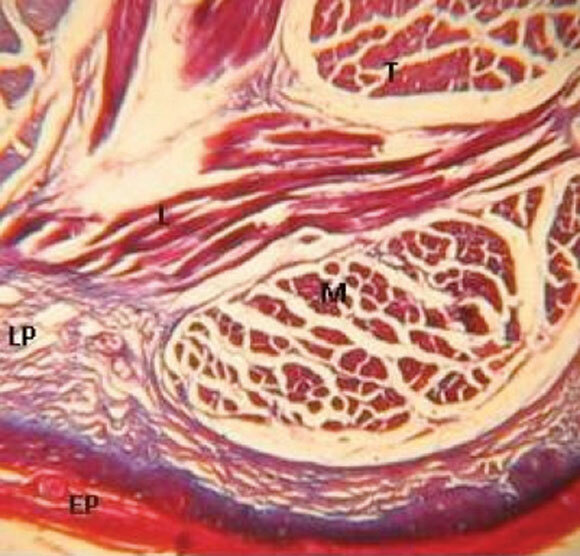 Demonstrable beneath the epithelium of all three mammalian species is the loose collagenous connective tissue, which makes up the lamina propria and extends to continue as the epimysium and perimysium that surrounds the various muscle bundles. 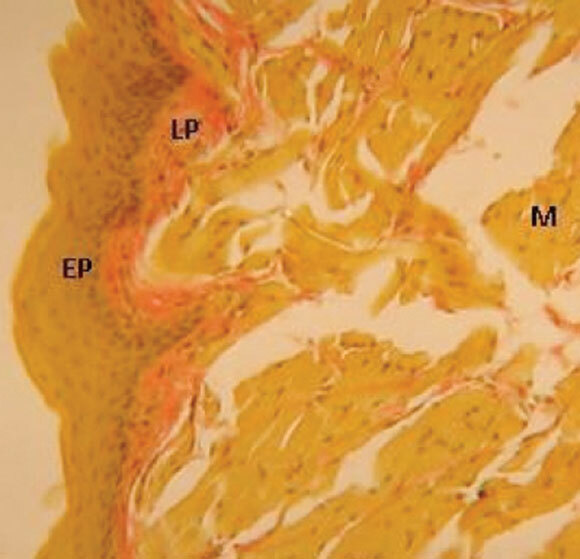 Like in all mammals, the lamina propria functions to bind the epithelium to the underlying muscular layer and also give a number of small projections called the secondary papilla that serves to support the papilla (Heath et al.). Though the rat and bat have similar connective tissue architecture, the lamina propria differ in the dorsal and ventral aspects in the tongue of the rat and also is more highlighted in the bat than in the rat. However, the pangolin has a more pronounced lamina propria which consists of more collagenous fibres compared to the bat and rat. Furthermore, a ring of collagenous fibres is distinctly seen surrounding the most central transverse muscle bundle in the anterior portion of the tongue. This collagenous ring is believed to confer on the tongue, tensile strength needed for protraction and retraction which in association with the complex muscular architecture seen in the tongue allows considerable and complex tongue extensions (Herrel et al.). Although the intrinsic musculature of the entire tongue in the rat and bat does not differ dramatically, clear differences in the organization and prominence of the muscle bundles were obviously more pronounced in the bat. 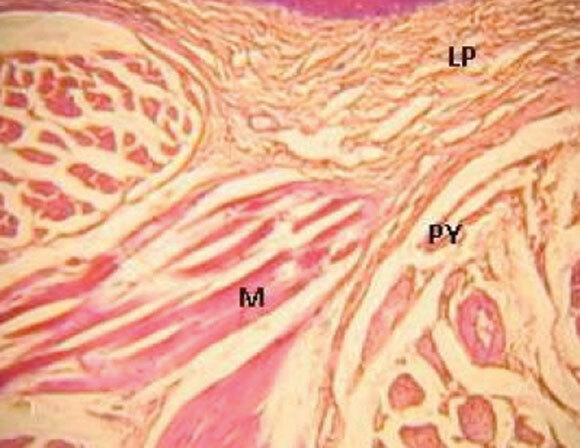 Reduction of these muscle bundles is quite evident in the central portion of the tongue of the rat than in the bat. However, the intrinsic musculature of the pangolin tongue follows a more distinct organization in the anterior and posterior portions. Anteriorly, the transverse, longitudinal and oblique fibres interlace with one another and at the central part of the tongue are a transverse muscle bundle surrounded by the collagenous ring. 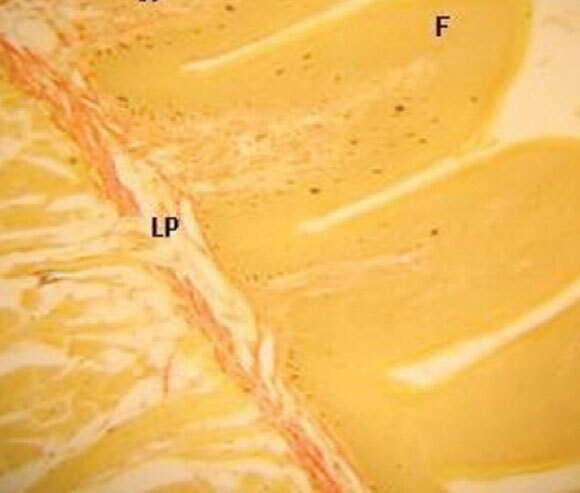 However, the posterior portion consist of outer transverse and inner double transverse muscle bundles, in-between the latter is a longitudinal bundle that wraps around it. While the intrinsic musculature in the rat and bat may constitute a mechanical basis for achieving various crude and delicate movements of the tongue during mastication (Heath et al. ), the complex and well developed intrinsic muscles in the pangolin, allowing considerable and complex tongue extensions, presumably play an important role during prey capture and transport. High vascularity appears to be apparent in the tongue of the bat than in the rat and pangolin. This may not be unconnected with oral absorption of food substances along the filiform papilla of its tongue. Also the presence of numerous peripheral nerves scattered amongst the muscular core of the bat tongue correlates with the increased number of gustatory papilla and taste buds in this animal when compared with the rat. This may indicate that the greater the innervation, the greater the number of gustatory papilla as well as the taste buds, which is accompanied by increased gustatory function as reported by Just et al. (2006). However, in the anterior portion of the pangolin's tongue, peripheral nerves consist of numerous fascicles surrounded by the epineurium. These fascicles are specialized mainly for general sensory reception and not for gustatory function. Although taste buds are present in the frugivorous bat and the rat, none was demonstrable in the pangolin. This fact accompanied with the peripheral nerves used for sensory reception may indicate that the tongue of the pangolin may not be involved in gustatory functions as compared to the bat and rat. Therefore, the well developed olfactory system in the pangolin (Fahey), may compensate for the lack of taste buds in the detection of food and gustatory function. The study of the comparative morphology of the tongue in the rat, bat and pangolin suggest that the tongue of these mammalian species exhibit significant micro-anatomical and structural variations that appeared to represent adaptations to their varying feeding patterns i.e. omnivore, frugivore and insectivore respectively. Also it revealed that while the bat and rat may have successfully evolved into true mammals, the pangolin, though a mammal still retains some characteristics of reptiles. Thus it may be regarded as a primitive mammal compared to the rat and bat.